DAQWORX Data Acquisition Software Suite helps the administrative department collect and monitor data on each section of the factory, including data on the usage of chemicals, gas, and electricity. A user-developed program written in Visual Basic, Excel macro, etc., transforms such usage data into an easily viewable daily report for efficient operation of the whole factory. DAQWORX monitors and records instantaneous flow rate data from JUXTA and instantaneous power data from POWERCERT in minimum intervals of 1 second. * The trend graph, bar graph, digital meter, etc., are readily available for use, so no programming work is necessary for them, thereby enabling quick system construction. * The number of connected units and that of channels could affect the minimum interval of data acquisition (DAQWORX DAQLOGGER can collect data from up to 1600 channels). While DAQWORX integrates instantaneous flow rate data from JUXTA, it acquires cumulative integrated energy data from POWERCERT. The integrated data are saved as a report file in the text or Excel format every hour on the hour. Such files are very useful for daily reports. * For example, a user can develop a report program in Visual Basic or Excel macro that opens 25 report files created by DAQWORX every hour on the hour, from 8:00 a.m. to 8:00 a.m. of the next day, in order to compute the usage for each hour in a 24-hour period. Such usage data can be arbitrarily arranged and presented in a daily report for printing. DAQWORX is the previous generation data logging software compatible with most Yokogawa recorders, data loggers, temperature controllers, and measuring instruments. 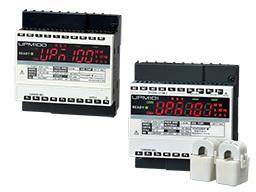 The VJ series limit alarms are compact, plug-in type alarm setting devices with easy-to-use functions. Four models are available: the VJAK for 2-wire system transmitters; the VJHK with DC voltage/DC current inputs; the VJRK with RTD inputs; the VJTK with thermocouple inputs; and the VJUK with universal inputs.